It is something incredibly spiritual. Surprisingly the non-ruminant even-toed ungulates, or suina, also comprise three groups. These are the Old World pigs, the peccaries from the New World and the African hippopotamuses (on this page only the big hippopotamus will be discussed, there is also a pygmy hippopotamus). The wild boar was described earlier, there are 7 more species of pigs. 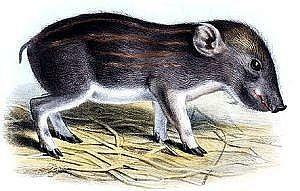 The smallest species is the pygmy pig from the Himalaya (10 kg), the biggest is the giant forest hog from Central Africa (275 kg). 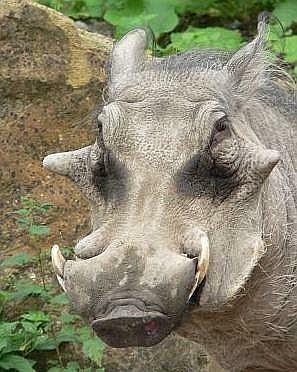 Other pigs are the common warthog, the warty pig, the babirusa, the bearded pig, and the red river hog. Several subspecies exist. We shall look into the criteria of characterization of ungulates and odd-toed ungulates and see if they can be applied here as well. 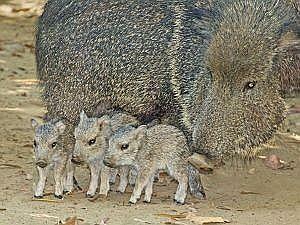 Peccaries (four species) live in dry to moist tropical forest and dry shrubland. They form herds of different sizes. All herds are subdivided into smaller family-groups. The herds have a territory, the centre of which is marked with dungheaps. Together these animals spend a large part of every day searching for food, by rooting up the soil with their disc-shaped noses. 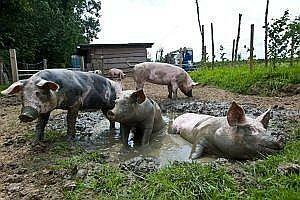 Like pigs, they like to lie around in mud wallows. Peccaries are rather aggressive and cannot be domesticated. When a group is attacked by a predator (a puma or a jaguar), all animals flee in different directions. Adult peccaries may seek the confrontation with the attacker and attack even a jaquar. Peccaries bite their attackers and can attack and kill humans. Collared peccaries often start the day with fierce games and mutual licking before they start looking for food. They are noisy animals. Pigs are skilful, agile animals. They like to take mudbaths and are able swimmers. Other features are: strength, adaptability and intelligence. They live in alternate landscapes of wood, marsh, shrubs and grassland. Some species, e.g. 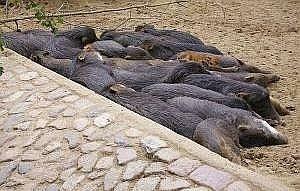 the red river hog, the bearded hog and the wild boar, need water and mud wallows. Pigs live in small family-groups, the males often live solitarily. Pigs are active at dusk and at night, more than during the daytime. The smaller species are more aggressive than the bigger ones, they may bite their opponents. 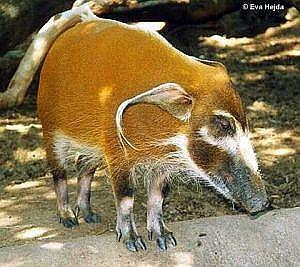 The red river hog is known to kill dogs with which they are hunted. 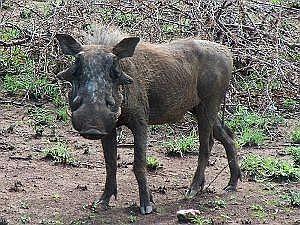 The common warthog chases leopards that take their piglets. Such an animal can only keep its prey by climbing a tree and waiting until the warthog goes away. The bigger species of pigs fight by pushing their heads against each other. 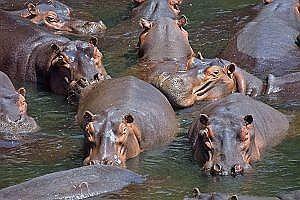 Hippopotamuses live mainly in and around water in groups of 20 - 30 animals. By day they stand close to each other in about 1.5 meter deep still or almost still water. As they cannot swim, they walk and stand on the bottom. The way in which they move in the water is called 'swim-walking'. The body is in part supported by the water and loses warmth to the relatively cool water. At the same time the animals do not dehydrate. At night they leave the water to graze, and before the sun comes up they move into the water again. The areas where they graze can be several kilometers from the water. On land their speed may be up to 30 km per hour, under water 8 km per hour. Along the paths from the water to the grazing areas, which they use for years and which can lie deep in the land, are big dungheaps. In the neighbourhood of water these can grow as high as 1 meter and as broad as 2 meters. Females just let the dung drop. Males also spin their tails while defecating to distribute their excrements over the greatest possible area. 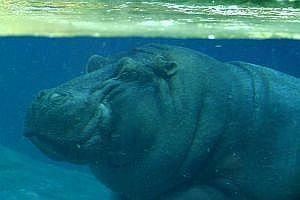 Hippos can stay under water for a long time, up to 5 minutes. Mostly only the eyes, ears and nostrils and a small piece of their back are visible. When they flee, they go into water. Mating, birth and suckling take place under water, too. 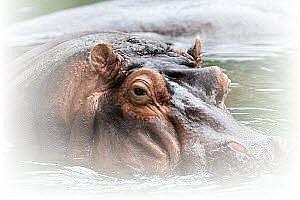 They not only let their droppings fall on land, but also in water, so hippos stand in water with their own excrements all day. The water gets rich in nutrients. This leads to lots of plankton, which attracts fish, and to the growth of waterhyacinth. When hippos are in the water and stand close to each other, they look peaceful. Nothing is more deceptive: the least disturbance may cause a burst of aggression. They are the most dangerous land-animals of Africa. The males also have fights among themselves, in which their huge canines can cause much harm and even lead to death. However, the hierarchy is not only established through threatening and fighting, but also through opening their mouth wide, loud noises, spreading of dung, running forward, throwing of water, and falling into the water. Also the males may stand next to each other and let their excrements fall. The one that produces the biggest pile is the winner. Peccaries are graceful, small suina that look like pigs. They have relatively long, slender legs with two hooves, and no dewclaws. The body is flattened sideways. The head is a bit above the backline and the posterior part of the body is higher than the anterior part. They weigh 20 to 40 kg, are 90 to 110 centimeters long and their shoulderheight is 40 to 60 centimeters. The nose is a pig-like disc-snout, it is flexible and flesh-coloured. Pigs are medium-sized and characterized by a muscular, somewhat rounded body, a short neck and a big, long head. The smaller species are flattened sideways. The legs are short and have four hooves. Pigs walk on two of them, the other two are dewclaws. The head ends in a disc-shaped, flexible nose. On the head of some species are wraths between the nose and the eyes. Some species have very long, bent tusks. Adult hippopotamuses weigh between 2500 and 3200 kg and are up to 4.5 meters long and 1.6 high. The animal looks like a colossal, squat, unformed mass. The body is barrel-shaped. The main part is the abdomen. Almost neckless, the rump changes into the head. The rump is a little bit higher just behind the head, which is below the backline and is dominated by the large, broad mouth, that can be opened (up to 150°) very wide. 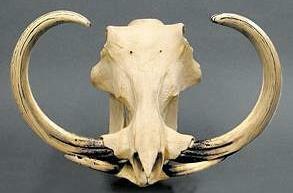 The skull is relatively small. The legs are short and plump and have four toes. Hippopotamuses have a great percentage of lean flesh and little fat. Food is used to renew the muscular tissue, it is not stored as fat reserves. Peccaries have a bushy fur coat with rather long hair. They are uniformly brown- to grey. Almost all pigs are uniformly dark coloured. 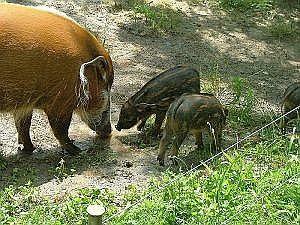 Exceptions are the red river hog and the pygmy hog. Piglets of the wild boar, the bearded hog, the pygmy hog, the warty pig and the red river hog are horizontally striped (light-brown). The skin of the hippopotamus is 4 cm thick and hairless. The thick skin makes up 25% of the body weight. In the skin are glands that excrete a red fluid which protects the animal against sunburn and infections. Peccaries are omnivorous. They eat roots, seed and fruit and sometimes they eat insects, worms and small vertebrates. Pigs normally forage in families. Their diet is diverse and found by rooting through the ground, loose material or rubbish with their disc-shaped nose. Many species eat plants, roots, fungi, bulbs, fruit, but also larvae, small vertebrates (frogs and mice), worms and carrion. 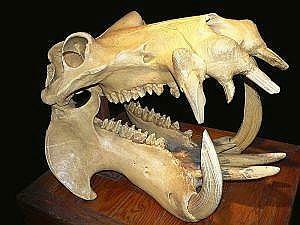 Some bigger species are pure herbivores (babirusa and giant forest hog). 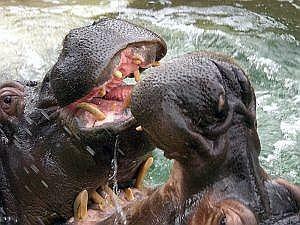 The hippopotamus is a plant eater. During the night they eat up to 50 kg of young, short grass, which they daily harvest from grazing areas, sometimes called 'hippo lawns', as this is what they look like. Those areas can be as narrow as 50 meters and as long as 1 km. They pluck the grass with their wide lips. Long grass they do not eat. In addition to this, they root through the ground with their canines, looking for roots. When they are in the water they digest their food. They have been observed to eat fruit and carrion. Hippos eat only about 1 - 1.5% of their body weight per day (rhinoceroses, cattle, etc. 2 - 2.5%). Their digestion is efficient and they do not use much energy, as they lead a half-floating life in the water. The stomach of peccaries is big in proportion to their body size (17% of total digestive tract) and has four chambers. On the anterior side of the glandular stomach (15%) is a gastric pouch (45%). Then there are two blindsacs (40%), one of which is anterior, the other more posterior. The large instestine takes up 30%, the small intestine 50% and the unimportant blind gut (cecum) only 3% of the digestive tract. Total length of the digestive tract is approx. 12 meters (12 x body length). Pigs have a simple stomach and a simple digestive tract of about 25 meters (18 x body length). 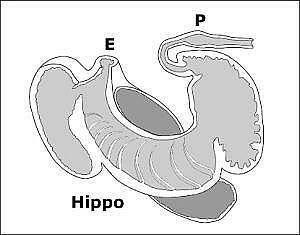 The digestion of hippopotamuses takes place in a big and complex three-chambered stomach, formed out of two anterior blind sacs, a stomach in the middle and a glandular stomach (the real stomach) posterior. The total volume is more than 500 liters. The colon is simple and very short, one of the shortest among ungulates. The digestive tract is 60 meters long, 15 x body size. A cecum (blind gut) is lacking. Peccaries have long, but for this group short, sharp, canines, visible on the outside. They are used to dig up roots and in defence. 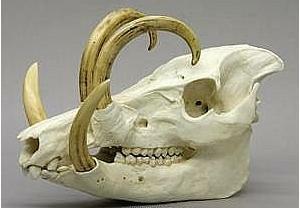 The incisors are perpendicular to each other (the lower ones stand forward, the upper ones vertical). The direction of chewing is more up and down (as with rodents) than grinding (as with other ungulates). Pigs have complete teeth, too. They have long, bent canines, aimed upwards. 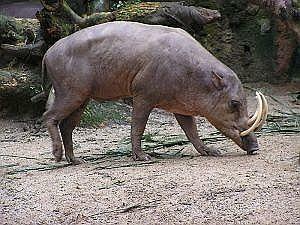 With some species (babirusa, warthog) they are extremely long. The red river hog has short, but sharp canines. The upper incisors can be small and are sometimes reduced in size. 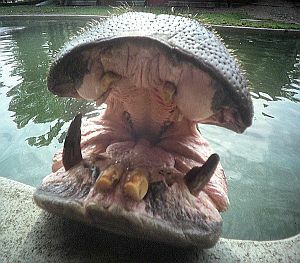 The blunt and thick canines of hippopotamuses may be up to 50 cm long. When the mouth is open they are clearly visible. The four incisors are big, they look like daggers and stand forwards. The molars are large. 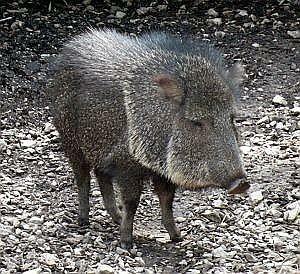 Peccaries have poor vision, the eyes are small. Scent and sound are developed well. Pigs smell extremely well. That is why they are able to find food hidden deep in the soil. Their hearing is good, too. The eyes are small, but vision is well developed. The hippopotamus has small eyes with thick eyelids and thick ears. It sees, hears and smells well. Standing in the water all day, they are not very active observers. Between the three groups there are similarities and differences. All three may behave aggressively, all have big canines, the stomach is the most important digestion organ and the senses are relatively small. Peccaries are the smallest animals. They have a flattened body and relatively long legs with two hooves and no dewclaws. The head is a bit above the backline and posterior they are a bit higher than anterior. 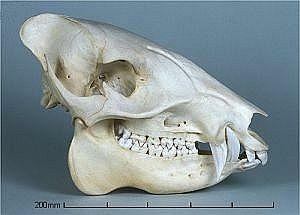 The canines are relatively short and sharp and the incisors are perpendicular. They are omnivorous. They attack their predators. Hippopotamuses are the largest animals. They have a long, barrel-shaped body with short legs with four toes. The head is low. The canines are long and blunt, the dagger-like incisors stand forward. They eat almost only young grass. They stand in the water. Pigs are the most versatile group, positioned between the other two. They have a plump body and legs with two hooves and two dewclaws. The head is more or less on a level with the backline. The canines of some species are very long, bent and they stick out of the mouth. The incisors stand forward. They are omnivorous. 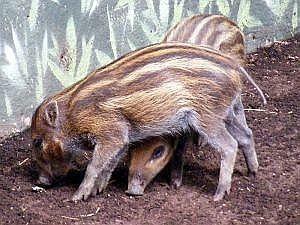 The piglets of about half the species are striped. The peccaries are the nerve-sense animals (flattened body, small sized, sharp canines, incisors perpendicular, aggressive). The pigs are the heart-lung animals (round body, medium sized, striped piglets, long, bent canines). 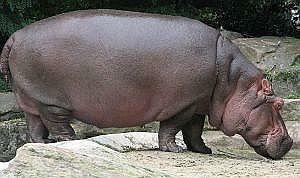 The hippopotamus is the metabolic-limbs animal (barrel-shaped body, massive size, blunt, long canines, eat grass). The peccaries have developed the legs (relatively long, only two hooves) and the hippos the metabolism (grass, complex stomach). Pigs are inbetween. Within the group of pigs we see herbivorous animals with long legs and long canines (babirusa, common warthog), grazing animals with a massive body (giant forest hog), small aggressive animals with striped piglets and sharp canines (red river hog, pygmy hog).